In a recent column, This Is Your Brain On Books, I briefly discussed Fritz Lemmermayer’s Haschische (1898) and the Yiddish translation published in 1911 with its stunning and evocative cover illustration. 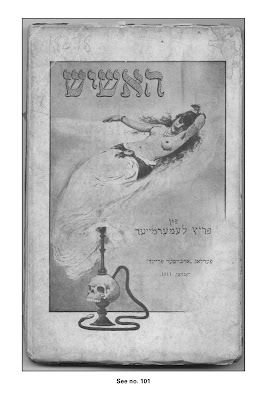 It is the only drug-themed book to ever appear in Yiddish. Only four copies of this rarity are currently found in institutional collections worldwide: in the British Library; Royal Library, Denmark; University College, London; and the Library of Congress. Hashish: an Orientalische legende fun Frits Lemermayer. Ibertzetst fun R. Roker. London: Ferlag Arbeyter fraynd, 1911. [132 pp. Octavo (21cm) in illustrated wrappers]. Image courtesy of Michael Horowitz of Flashback Books. Hats off to Hadara Graubart at Tablet Magazine, and Naomi at The Jewish Publications Society blog, for their attention. In other news, Canadian author and journalist, Brian Busby, today reports on a very unusual Canadian novel, Up the Hill and Over by Isabel Ecclestone MacKay, that turns on "perhaps the most remarkable and improbable coincidence in all of Canadian literature." The author wasn't on drugs but one of the characters is.